With joy I send my greetings, my congratulations and my wholehearted AXIOS! Your thirty-year tenure (it's all been here at St. Innocent, right?) in the metro-Detroit area has been an inspiration to the local clergy. 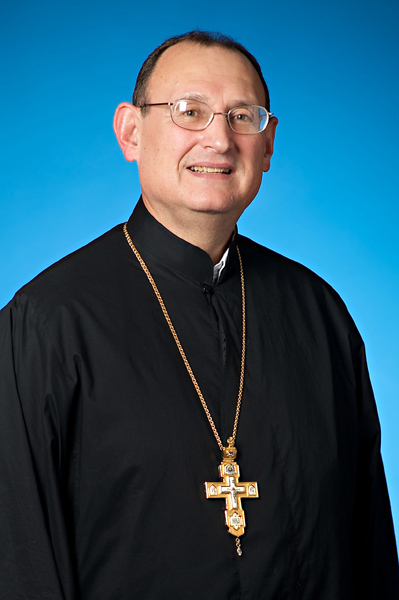 Your dedication to all things of Christ and His Holy Church — your parish, your Deanery, your diocese, the St. John Chrysostom Clergy Brotherhood, the COCC [Council of Orthodox Christian Churches], the OCW [Orthodox Christian Women], the Society of Moses the Black, the work of ODO [Orthodox Detroit Outreach], the celebrations of fellow clergy and their parishes, and much, much more — reveals the tireless sharing of yourself and the priesthood which was given to you. In anticipation of our Lord's own words, "Well done, thou good and faithful servant .... Enter into the joy of the Master." I am sorry to be sending a letter to be read by another, rather than delivering this greeting personally. Unlike you, I have never learned the secret of bi-location. You manage to attend everything at all times, and I still cannot figure out how to get from my own parish's Sunday events to St. Innocent in Redford before the dust settles on your gala afternoon. Please accept my apology, and know that you and your ministry are always in my commemorations. Enjoy the celebration and the day, my dear ones. It is an occasion for a much experienced, yet rarely articulated appreciation. Tomorrow will soon dawn and the work of the Kingdom will begin anew. May God greatly bless both of you as you continue in His service.